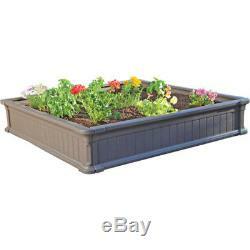 Lifetime 4' x 4' Raised Garden Bed, Brown. Patio Garden Gardening Lawn Care Gardening Raised Garden Beds ThenLifetime 4x4 Raised Garden Bed gives you the perfect garden setup in less than one hour. The Lifetime 4x4 Raised Garden Bed is constructed of UV-protected high-density polyethylene (HDPE) with a simulated wood design. It is low-maintenance, weather-resistant and will not rot, crack or peel. The walls of this brown Lifetime Garden Bed are nine inches high, and two beds can be stacked together to create 18-inch walls to accommodate deep rooted plants. With its easy, do-it-yourself assembly and low-maintenance features, gardening has never been this easy with this Easy Raised Garden Bed. Easy do-it-yourself assembly no tools required. Full garden set-up in less than 1 hour. Stackable design creates 18 high walls. Low-maintenance, simulated wood design emits no toxicity. Constructed of UV-protected high-density polyethylene (HDPE): will not rot, crack or peel. Absorbs and retains the needed warmth for root development. Assembled with US and imported parts. Soil mix: 3 equal parts, vermiculite, peat moss and compost (16 cu ft of mix total). Weed barrier: enough to cover the underside of your box (4' x 4'). Seeds or starts: see included how-to garden guide for tips on plant spacing. 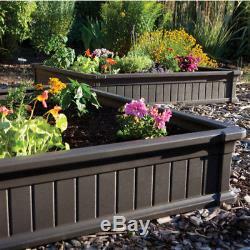 ThenLifetime 4x4 Raised Garden Bed gives you the perfect garden setup in less than one hour. The item "Lifetime 4' x 4' Raised Garden Bed, Brown" is in sale since Tuesday, August 15, 2017. This item is in the category "Home & Garden\Yard, Garden & Outdoor Living\Gardening Supplies\Plant Care, Soil & Accessories\Baskets, Pots & Window Boxes". 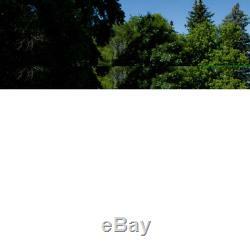 The seller is "fortunepals" and is located in Phoenix, AZ. This item can be shipped to United States, Canada, United Kingdom, Denmark, Romania, Slovakia, Bulgaria, Czech republic, Finland, Hungary, Latvia, Lithuania, Malta, Estonia, Australia, Greece, Portugal, Cyprus, Slovenia, Japan, China, Sweden, South Korea, Indonesia, Taiwan, South africa, Thailand, Belgium, France, Hong Kong, Ireland, Netherlands, Poland, Spain, Italy, Germany, Austria, Russian federation, Mexico, New Zealand, Philippines, Singapore, Switzerland, Norway, Ukraine, Croatia, Malaysia, Brazil, Chile, Colombia, Costa rica, Dominican republic, Panama, Trinidad and tobago, Guatemala, El salvador, Honduras, Jamaica.